Thanks for your interest in the DCF Exchange. 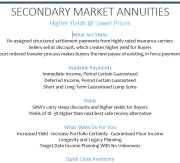 Advisors will get a call from us to discuss how secondary market annuities can fit into your practice, prior to us approving your access. Please ensure you whitelist emails from us. You can do this by finding the confirmation email that was just sent to you, and move it to your email inbox. This ensures future emails will be delivered. As a special thank you, please download the SMA Executive Summary to the right. It’s a good quick primer on structured settlement payments.